Look, we all have things about our body that we’re secretly - or not so secretly - proud of. Like the mom in Freaks & Geeks says, you have a beautiful body! Don’t be afraid to show it off! Sure, you might make some people uncomfortable, and you might even get arrested, but it’s only because you just have so much body positivity! Right? It’s nothing to be ashamed of! In fact, if you’re a proud Scotsman who gets - ahem - excited to to show off his biggest asset, then this What’s Under the Kilt Costume was made just for you! With all the thrill of surprising and delighting everyone who maybe didn’t really need to know that much about you, but okay, guess this is where we are right now, this What's Under the Kilt Costume will give you the rare chance to show ‘em what you’re working with, but in a (slightly more) socially acceptable way! The black polyester shirt has long white sleeves and plaid accents on the torso, and flouncing over it is a white satin ascot complete with lace edging, because you’re funny and fancy. The ascot attaches to the read plaid sash with Velcro, and the sash attaches to your right shoulder and hangs loose in the back for an authentic touch. The costume even comes with a black tam o' shanter hat that sports a red pom pom and a red plaid brim, and even the white socks have matching plaid cuffs! 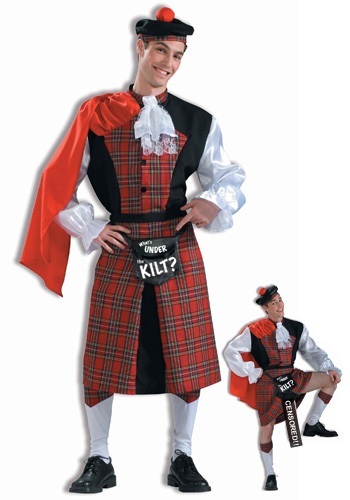 The red plaid kilt has a black inset and an elastic waist to keep you comfortable when you’re constantly raising your leg after someone dares to read the ''What's under the kilt?'' that’s sprinted on the black pouch attached to the kilt. And, of course, the main event - a stuffed shiny 18'' weiner is secured around your waist and legs with stretchy elastic. One flick of your Scottish wick, and you’ll have ‘em all shrieking out in horror, but in the best way!